I’ve been in Seattle across in America for the past week on a business trip. 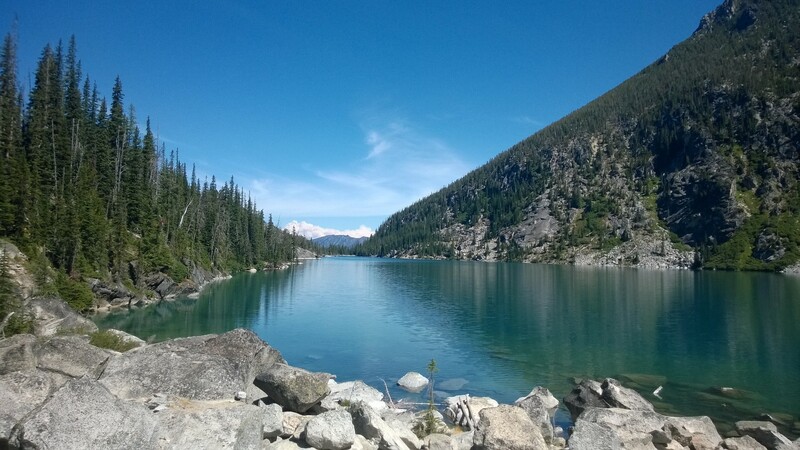 Due to a number of reasons I didn’t get to fly home until Sunday afternoon but had all Saturday free so I decided I would plan a little running adventure into the nearby Cascade mountain range to help train for the Matterhorn Ultraks coming up later in August.. The Cascades are a range of mountains which run from British Columbia in Canada down the western coastline of the USA down to California. They are an impressive range of mountains with numerous volcanic peaks which top out above 4000m. Compared to what I’m used to in Scotland, the Cascades are a lot more rugged and rocky mountains. They have an abundance of peaks over 1000m and, thanks to a combination of a famous Scotsman and an over-active US Forestry Service, there is an comprehensive range of marked and unmarked trails all over the map of the National Parks in America. After some research online, I found a circular route which took in what looked to be an area of outstanding beauty. 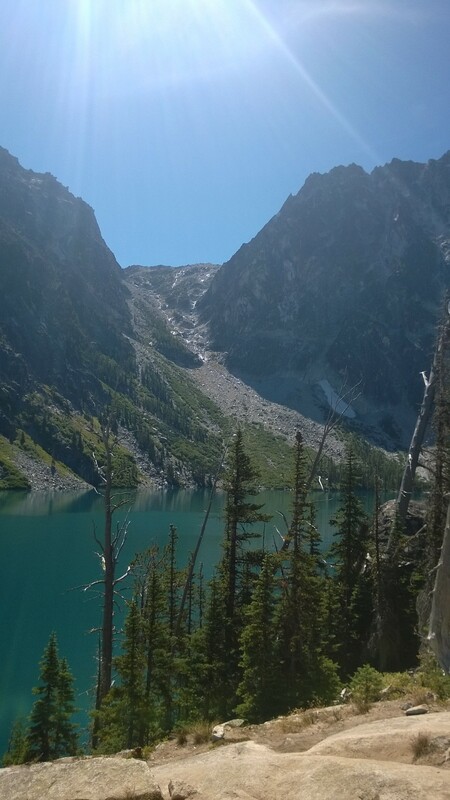 The Enchantment Lakes sit in an area South West of a town called Leavenworth in the North Cascades. More about Leavenworth later as it is itself, a very interesting little town. I chose the route for a couple of reasons. Firstly, it was a reasonable distance. I wanted something over 40km long to make sure I got some distance in my legs. Secondly, I wanted something with plenty of elevation and in trails which would be similar to what I’m likely to find in Zermatt later this month. That meant steep climbs on rocky trails with some 2000m+ of elevation and the enchantments seemed to offer all of the above. It was difficult to get an exact distance for this route as most people do a section of the loop. In America the trails in this type of place are marked with a trail head, which often has a carp park and some simple facilities. The route I was doing had two trail heads whose trails met in the middle, but there was also a road which linked the two trail heads in the opposing direction which enabled you to form a loop. Most guidance suggested that you leave a car at one trail head and then drive up to the other and start your hike from there. That is all well and good when you are part of a group, but as someone who was out for a day on his own, I opted to run from one trail head to the other to start the day. With my route planning done, I invested in a map of the route from the wonderful REI (we need a comprehensive outdoor shop like this in the UK!) and stocked up on bottled water and Tailwind to get me through the day. The weather was forecast to be 39 degrees, blue skies and barely any wind, so I packed some factor 50 sunblock too. I set off early from my hotel in Bellevue and drove for 2 hours to make it to the start of the run at 7am. 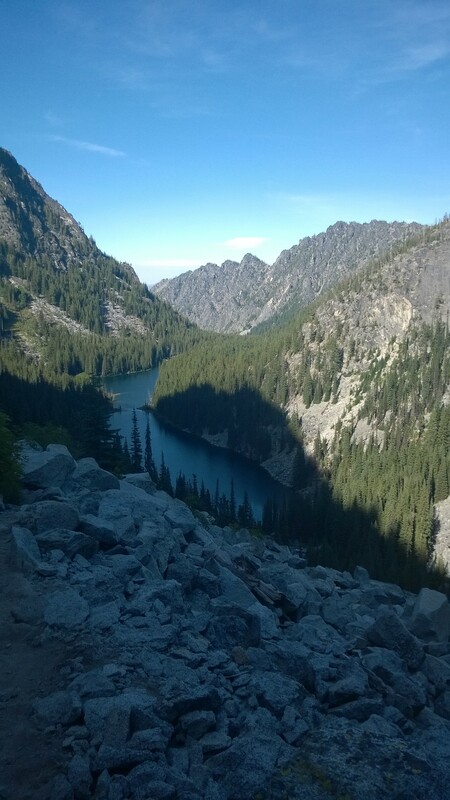 After some last minute checks to make sure I had everything, I set off North up the road from Snow Lake trail head towards Stuart Lake trail head. Already, the views from the car park were outstanding and I knew I was in for a great day. In my preparation I’d found someone on Strava who had done this same run in reverse. That meant I knew the elevation profile I was heading for and so set off at a leisurely pace. At this time of the morning the road was getting a bit of traffic from other people heading up to the higher trail head and I could see some people staring at me as they went past wondering who the crazy guy as running up the road. I later passed people on the trail who were hugely supportive and were amazed someone was actually running this thing. It did worry me a bit about what was to come as they were so overly amazed. After about an hour of running to cover the 10km from the car park I reached the higher level trail head. I’d already broken into a fast hill walk on a couple of occasions as the climb was gradual, but in places quite steep. It was a relief to finally exit the road and get onto narrow forest trails to make the last bit of climb before the first lake of the day which was Colchuck Lake. The first trail section from Stuart Lake Trail Head to Colchuck Lake seemed to go quite quickly. It was fairly steady going all the way but a little technical in places and a few slopes that meant it was difficult to do much more than a fast walk. 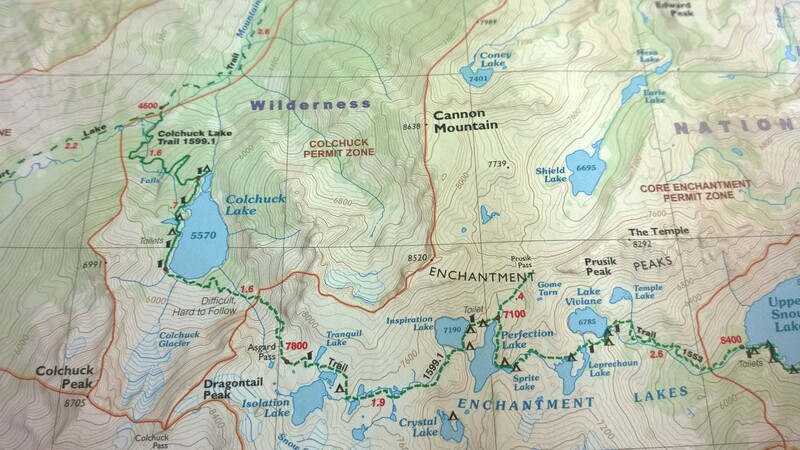 There was also a junction about two thirds of the way along this trail, from which one direction went to a dead end at Stuart Lake and the other broke off towards Colchuck Lake. Fortunately I managed to spot this, but I really was fortunate. 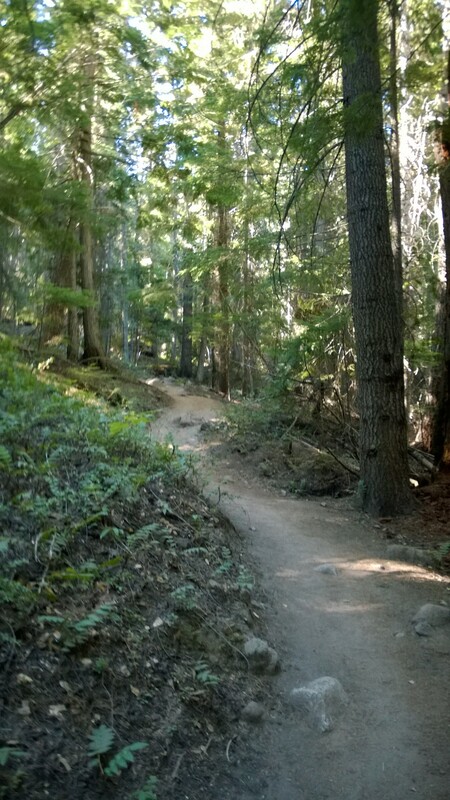 The marker boards on these trails are made out of wood that has weathered well to camouflage itself against the surrounding trees at just above head height. If you have your head down and sweat in your eyes, it is difficult to spot them, so you have to keep your eyes open and also use your map to anticipate where these points might come about. I eventually reached Colchuck Lake and from here the trail traverses the shoreline for about a kilometre or so. This was a relief as it felt like I was now in the run proper and the fun bits were still ahead of me. At the far end of the lake the trail loses its structure and crosses a boulder field. There were cairns marking a general direction, but it was fun boulder hopping and this section passed pretty quickly. At the end of the boulder field was a small beach which was being used as a campsite and I took the opportunity for my first dip of the day from this beach. The water was welcoming and cool as the air temperature was already above 30 degrees and it was only about 10am. I’d also started to warm up here as the trail was now out in open rocks rather than woodland. From this point on it was going to be a very hot day. But the views were already making up for it! The next section was Aasgard Pass. This is a steep climb between a couple of gnarly, jagged peaks which gives access to the upper enchantment lake area. Having seen the photo’s online of what was waiting for me at the top, I was keen to get the climb over and done with as quickly as possible. The pass rises about 600m over just over a kilometre in distance. I’d stopped to chat to a guy before the boulder field who was heading back the way I’d come after coming down off the top. He explained that the way up was to stick to the left, away from a waterfall that comes right down the middle of the pass. I was glad of the guidance as I could see others heading to the right and that route got much steeper the higher you climbed. This was one tough climb for sure. I was going pretty well for the first third of it, with frequent stops at the little streams which fed off the waterfall for a quick dunk of my hat to cool off. The combination of heat, climbing and tough rocky terrain was too much to result in anything but a slow slog to the top. I took every opportunity for some shade amongst the random tree along the way and large boulder I passed. There was some scrambling to be done about 100m from the top of the pass and from here it started to level out and I knew the worst was over. Creeping over the final section, looking back the views were fantastic, but I was already starting to see what lay ahead and my energy levels rose as a result. At the top of the pass my first priority was to cool down, so Tranquil Lake, the first one you hit as you come over the pass, got the honour of me diving into it. The water was beautifully cold and I immediately realised how over-heated I’d become on the climb up. I took some time here to get my temperature back down and take on some fluids and calories before making a start on the winding trail that now lay ahead of me through the rest of the lakes. When I was reading up on this area I learnt that there was a large population of mountain goats up here and that most people are likely to see one or two during their hike. 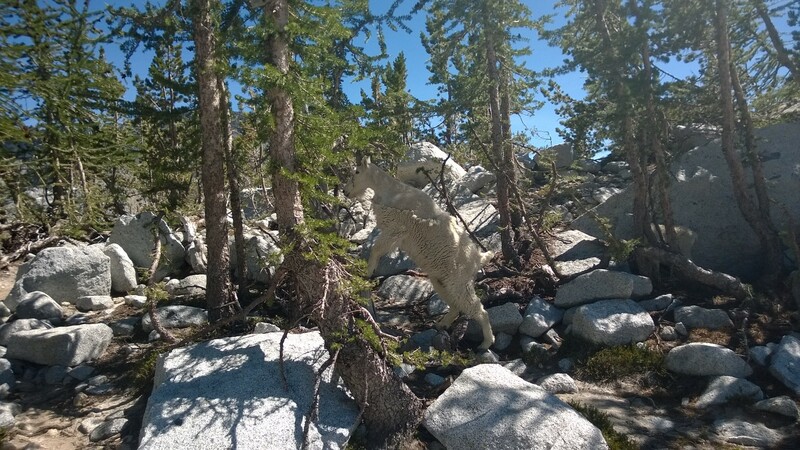 I’d already spotted one on the way up the pass, but once up in the main lake area, these things were everywhere. They seemed calm enough, but were keeping a distance from the many humans that were around up there. I later took a pee against some rocks and within seconds a goat appeared from nowhere, attracted by the prospect of licking the salt that would be left behind on the stone. It politely stood its distance until I’d finished then promptly stepped in and started to go at it. A strange encounter for sure. I knew that from here it was all down hill. The trail was still indistinct and someone had generously created cairns of all sizes to give a rough indication of the way to go. The conditions from here ranged from slab rock, boulders, open grassed area and what I’d call a sheep path, barely a foot wide but enough to run on. From my study of the map in planning, I recognised that the pass was the hard bit and after that I should be able to enjoy myself with the long loping down hill section. I hadn’t really paid attention though to the distance. I recognised as I started weaving my way through the lakes, that actually I still had about 25km to go! This weighed down on me a bit as I think I’d somehow convinced myself that once over the pass it would be easy. Whilst it was downhill, it was far from easy. The term technical is often used to describe trails, but it wasn’t until I’d run this that I felt authorised to use the term. As the way meandered through the different lakes, to descend the elevation there is effectively a step between each lake. It makes sense of course now I say it, but it came as a shock on the day. Some of the steps were considerably significant and dropping a 100m or more at a time, often over boulders, slab rock and rarely via switch-back paths. 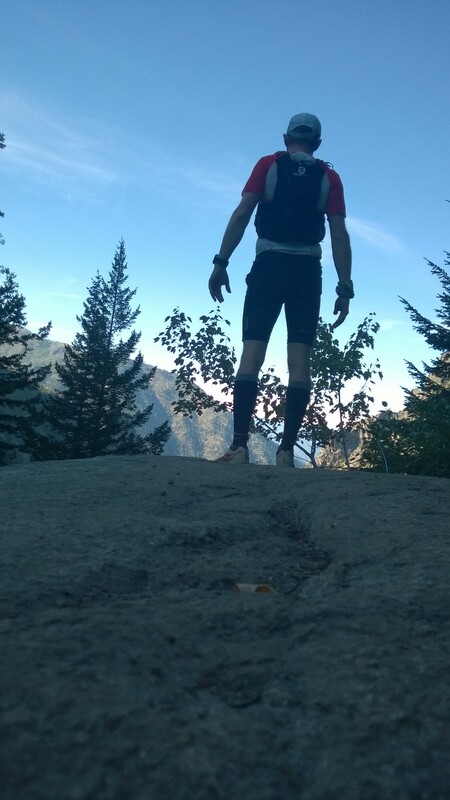 I quickly got used to running over the slabs and the boulders and would even describe it as fun. I was passing people now who were gingerly tip-toeing down and I must have looked like a lunatic as I went whizzing past shouting my hello’s. On a couple of occasions I clipped a toe or missed a footing and had to check myself. By now I was about 20km+ into the wilderness and attempting to make my way back from here with a sprain or worse would be a nightmare. I reminded myself that I was here to enjoy myself and the scenery and so slowed down again. Every lake I passed which offered the opportunity to swim in from a beach or shallow shoreline, I swam. Every waterfall that came of the bits of remaining glacier, I drank from. I went through half a bottle of sunscreen and took pictures with wild abandon. I was in my element. I’d stopped paying attention to where I was but after a while I could feel myself tiring. I took out my map and eventually worked out that I was by the outlet of Perfection Lake into Sprite Lake. that meant that I had about 15km still left to go. I’m not sure where about around this area it happened, but I got to a point where I realised I was looking down a valley that I still had to run through to get back and, given how challenging and slow the running was going due to the conditions of the trail, I knew I was in for a long day. From here, it was head down and keep moving. My experiences from the ultra marathons kicked in and I knew I just had to keep forward momentum, keep eating and keep drinking and it would be fine. I slowed my pace down to conserve energy as I was running low on fuel. I also took out my map and worked out where I was going to have the remaining stocks of things to eat and drink along the way. this helped, it made me feel like I had a plan and that I knew how to do it. A couple of hours later I was heading out of the end of the valley and hitting the last section of switch back tracks which led back down to the car park where I’d set off from 10h 30m earlier. The valley had been in the shade most of the afternoon. With the water cascading down it, the air was lovely and refreshing. As I neared the end, the trail turned the corner and went back into the sunshine. Wow what a difference! It was like running into a furnace. when I got back to the car, the temperature gauge was reading 42° centigrade as it sat in the sunshine. I took the opportunity to cool down in a river which ran past the carpark, stripping down to my shorts and taking the equivalent of an ice bath in there. Despite the warm weather, the water temperature was still ice cold, which was perfect for giving my tired legs some well earned relief. Back at the car I met two girls who were preparing for doing the run between the two trail heads the next day. They were asking me about how the route was and any tips. They were also kind enough to share a beer with me in return. thanks guys and I hope you enjoyed your run the next day! 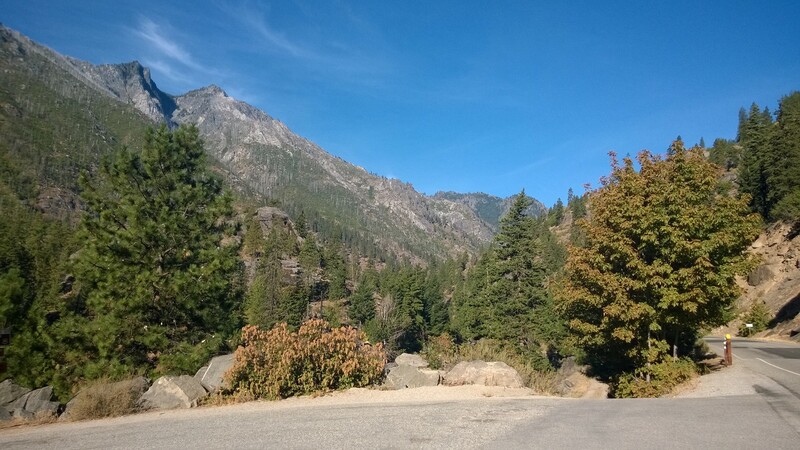 Before driving back to Seattle for the night I stopped off in the town of Leavenworth. Most people probably haven’t heard of this place, but everyone who gets the opportunity should visit it. Leavenworth was a mining town until a few decades ago when the mining business became unprofitable. The clever folks who lived there came up with the idea of turning it into a theme town to attract tourist dollars, and for whatever reason chose Bavaria as the theme. given its Alpine like location, it actually works pretty well. Almost all the building are chocolate box houses, with German and Bavarian flags hanging off every balcony. There are people in the streets with lederhosen and felt hats. If it wasn’t for the thick American accents you could easily be forgiven for thinking you were in a town just outside Munich. The best part about it though? They have their own brewery which, for a tired runner like me, provided just what I needed to end a perfect day. Icicle Brewery Pale Ale….or what’s left of it. If you are ever fortunate enough to get to this part of the world, you could do a hell of a lot worse than visit the Enchantment Lakes. they are possibly the most beautiful place I’ve ever been to and even now, days later, I am still on a massive high. My run wasn’t fast or particularly special in any way, but I am so happy I took the time to make this trip and see this place. I think it was also great preparation for my Matterhorn Ultraks race in a few weeks time. I’ve now seen what running in these high mountains can be like and can mentally prepare. Next stop Zermatt! Link to Strava activity and below are some more photographs from this amazing day out.